The U.S. Food and Drug Administration (FDA) Office of Prescription Drug Promotion (OPDP) issued a Warning Letter this week to Duchesnay, Inc. related to celebrity Kim Kardashian’s social media posts on Instagram, Twitter and Facebook regarding the company’s drug, DICLEGIS. 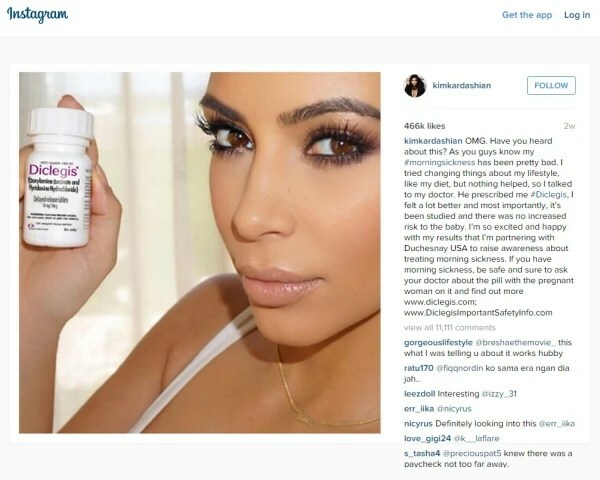 In the posts, Kardashian states that she is “partnering with Duchesnay USA to raise awareness about treating morning sickness.” The matter came to OPDP’s attention through a submission to the FDA’s Bad Ad Program, which provides a mechanism for health care providers to report potentially problematic drug advertising. OPDP determined that the Kardashian social media posts were misleading because they (i) present various efficacy claims for DICLEGIS without communicating any risk information; and (ii) fail to provide material information regarding the drug’s full approved indication and important limitations of use. OPDP requested that Duchesnay provide a response to the Warning Letter by August 21, 2015, including a plan for discontinuing the use of these materials and a “comprehensive plan of action to disseminate truthful, non-misleading, and complete corrective messages” to the audiences that received these materials using, to the extent possible, the same media for the same duration of time and frequency as the material disseminated. This is not the first OPDP letter related to a celebrity endorsement on social media. OPDP also has issued a number of letters related to the use of social media generally, including metatags, Facebook pages, and Facebook ‘share’ features. These letters provide important direction to life sciences companies regarding the review and approval of endorsements and promotional information distributed through social media channels.